Ever wonder how repair shops know what cost to advertise for a brake job if they don't know what the problem is? They don't. 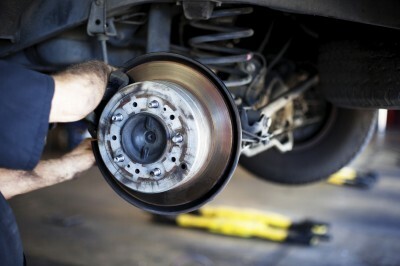 We believe you can only tell what a brake job will cost after a thorough inspection of the brake system. You really do get what you pay for. THERE ARE COMPLETE JOBS & JOBS THAT AREN'T. TEST DRIVEN- Your vehicle is taken for a test ride to verify your problem. With a minimal brake job most don't bother with a test drive. COMPLETE M.A.P. INSPECTION IS DONE- The brakes of all four wheels are checked, including the parking brakes using the Motorist Assurance Program guidelines. The results are documented and explained to the customer. A lot of garages don't follow M.A.P. guidelines. A QUOTE IS GIVEN- A quote is given on what is needed, and only an approved repair is done, which includes servicing the rear brakes. They are cleaned, re-lubricated and adjusted. FLUID IS CHANGED- Old, dirty brake fluid in the master cylinder is drained and replaced. Other garages don't replace the contaminated brake fluid. .ROTORS ARE MEASURED AND CHECKED- Thickness variation of all the rotors is measured with a micrometer. Variations can cause brake pedal pulsation or the steering wheel to shake as the vehicle stops. The rotor vanes, or cooling fins, are checked for mud and rust. Clogged vanes could affect the rotors' ability to remove heat from the brakes. This could lead to premature wear. FLUID IS REPLACED FROM THE LOWER PART OF THE SYSTEM- The dirty brake fluid is drained. A special clamp is attached to the hose leading into the caliper before pushing in the caliper piston to remove the caliper. This prevents the remaining contaminated fluid in the caliper from flowing hack into your vehicle's anti-lock braking system, which can easily damage that costly unit. Others don't take the time. PARTS ARE LUBRICATED- All metal-to-metal parts are lubricated. PROPER TORQUE IS USED- The wheels are put back on, each torqued to the proper specifications. Many don't torque at all. CALIPERS ARE READJUSTED- Break pedal is gently pumped to get the calipers readjusted.